These (mostly male) cyclists travel in packs, with one leading the way, opening a spot in traffic, and others flowing in behind before the cars close up the opening. Woe be to the car that tries to close up too quickly. The motoboys will kick or punch your car if you cut them off. And your only response can be a muttered curse; you don't dare get into it with a motoboy. You will lose. As we drove from the airport to our apartment, we learned a great deal about the city from our sponsor, Ken. 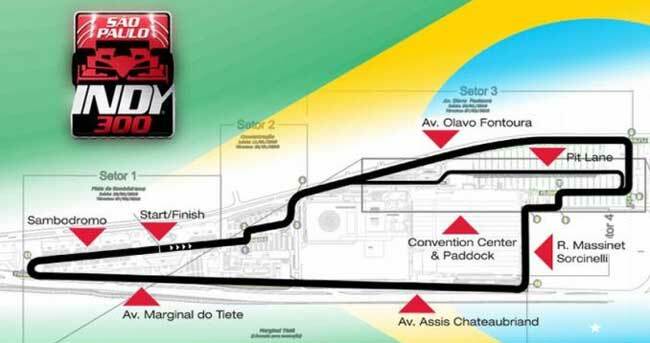 We learned that on April 28-29, the streets of Sao Paulo will echo with the sound and fury of the Indy 300, as Indy cars ply the streets of the city and race through the Sambodromo. Consequently, many of the streets are being prepped for the onslaught of high-speed autos with their massive tires. Ken learned the hard way that traffic tickets in Sao Paulo are issued electronically. You never know you’re getting a ticket until you receive mail telling you that you were cited, typically caught on a traffic camera, and you will receive your ticket at a later date. There is no arguing, no plea bargaining. You pay what you owe and accept the wages of sin. We also learned that the two-hour trip from the airport to our apartment was a little longer than normal, due to unexpectedly heavy traffic. Basically, we were in a parking lot along the Ayrton Senna portion of the drive. (Senna is a famous Brazilian racing driver who died in 1994.) 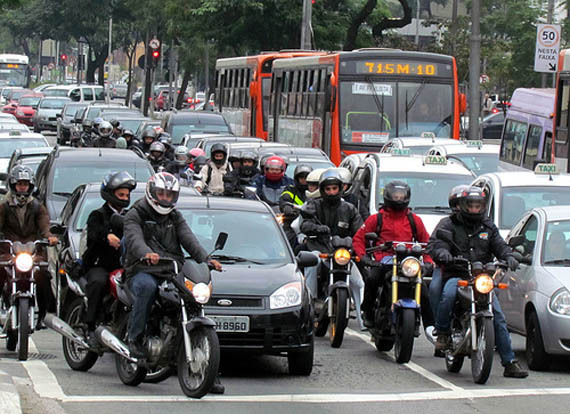 Traffic in Sao Paulo is legendary; as are the 35-mile traffic jams. On our drive, the only vehicles that seemed to move through the slogging traffic were motorcycles and motorbikes. 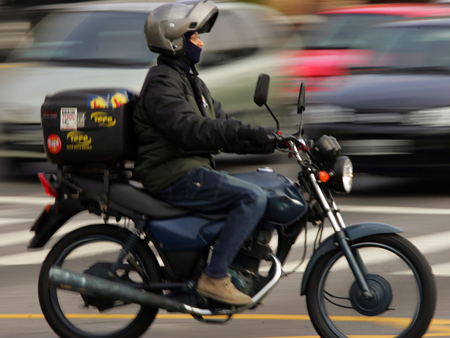 Many of these were driven by the (apparently) notorious “motoboys,” couriers with packs on their backs or small cargo boxes on their cycles, who weave in and out without regard for life or limb, at full speed or in stalled traffic. According to Ken, the daily death rate for motoboys is between 7 and 8. Daily. These (mostly male) cyclists travel in packs, with one leading the way, opening a spot in traffic, and others flowing in behind before the cars close up the opening. Woe be to the car that tries to close up too quickly. The motoboys will kick or punch your car if you cut them off. And your only response can be a muttered curse; you don’t dare get into it with a motoboy. You will lose. Where is the race in relation to where you are living? I’m guessing it’s about 7-10 miles, not much more. I’m wondering whether we’ll hear the sound, but there are so many skyscrappers between us and the race that I doubt it. I believe it will be north-northeast of us. At least they wear helmets! It’s good to see them all wearing helmets, at least. Probably useful for hitting offending cars, as well.